I love to find a new, local, delicious recipe to take home and re-create. Despite numerous journeys to every Hawaiin Island, I only discover saimin this week. It is a dark and stormy day. I have a craving for the local Hawaiin noodle soup known as saimin -a meal in a bowl. This soup is a tasty mix of many cultures. The origin of saimin is either Japanese or Chinese. A Japanese chef says it is Chinese in origin and a Chinese chef says it is Japanese. Whatever it is, we found it delicious with local meats, veggies and Singapore style noodles. Saimin can be created with an array of any meat or fish, veggies and noodles. I prefer Chinese mein, Singapore, udon or ramon noodles. When on the islands of Hawaii, I love the Chinese roasted pork-called char siu, or barbequed chicken to add to my saimin. Today, my first day, tired from a 17 hour journey and wet from the downpour, I spent my first hour creating my saimin, using what I could find at the local market. I added Chinese cabbage-bok choy,and dried seaweed-nori, to my clear, hot broth made from sashi, a Japenese soup stock which is easy to find on Kauai. Tomorrow I will find some fresh shrimp, and maybe some dumplings to add to my steaming meal in a bowl. Saimin tastes even better on the second day with added flavors. 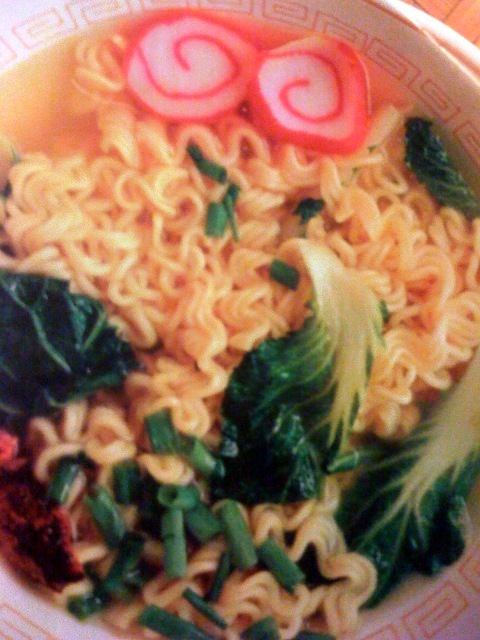 Local custom: Use chop sticks for the Saimin ingredients, then pick up the bowl and slurp the heathful hot broth.